After many years of owning a mk2 version of this radio I read a number of posts where people felt the mk1 was a better radio? Intreged, I wanted to try one.I had a tidy bezel and mint cases and I waited for Nick to have one for sale. We'll one did turn up and it was untouched inside. I had an eprom for uk1-40 and a switchable bleep done. It took 11 days to arrive from the postman (mainly due to the snowy weather) Well although I received good local reports, Dx qso's remained illusive. Untill tonight. With my astatic on it I got into france on usb and then Portugal and finally Spain. The mk1 is a proper Dx radio. The copies tonight mean that all my ssb radios are pucka dxers now. Wheel Bender 1982-88/ 2007- ??? keeping the older radios on air. Not in the cupboard or the past. 80ch legal- America on ukfm- CB radio can be better 2nd time around. There's not much between the mk1 and mk2 IMO. It's more important to get a 148 that hasn't been molested inside than to worry if it's a mk1 or mk2. This applies especially to the mk2 where everyone and his dog became overnight rig doctors when it became apparent how easy it was to add extra blocks with just a few diodes. I saw so many that were bodged. I could list of loads of pros and cons between both variants but despite this I like them both about the same. I do think the mk1 has the best Tx audio on SSB of the two but conversely it also has poor FM Tx audio. The input AF stage isn't as well RF decoupled on the mk1 either plus it distorts if overdriven and this can make it a pain with power mics etc. The mk1 does have a few gremlins and you can see how many Uniden found because the back of the main PCB is littered in last minute factory fudge mods on a mk1. Note that the Uniden mk1 schematic has parts missing from it that are some of these last minute fixes by Uniden. I do have a mk1, I rescued one in bits (no panel or knobs or cases etc) in a job lot of CB scrappers but I converted it to 7MHz operation many years ago. I guess I'd buy another one for nostalgia if an unmolested one popped up on ebay etc. 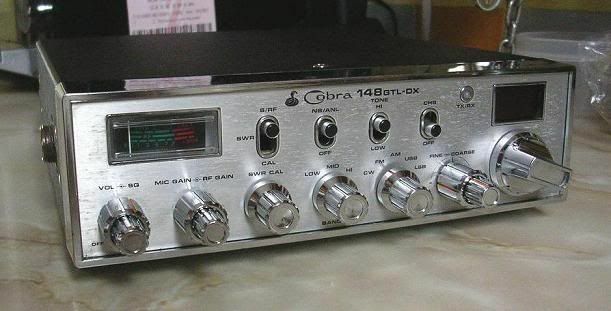 "it does take a sledgehammer to move the S meter on a mk1 148..."
I had a mk 1 many moons ago, it was unmodded, a mate of mine had a mk2, after a comparison we found the mk 1 deaf as a post, so i returned to dare i say it, cybernets. My mate still has a mk2, he was a good rig doctor back in the day, dosent really bother nowadays, he dug his mk2 out of mothballs recently and did a mod to it to make it far more sensitive, whatever he did, he compaired it to a rci2950 and the old snake is far better in every way. Will try and find out what it is and if it can be done to mk 1's too, i know there is a crystal filter involved somwhere. Nick does a receive mod on the mk2 that entails changing a resistor and probably something else? The mk1 I have is very sensitive but as you say not as sensitive as the mk2. The skip riding abilities of the mk1 impressed me last night. The cobra 1&2's are well worth the space on anyone's bench. It's so long ago I can't definitely remember what I did to the mk1s for receive but I do remember a few things. Also if you are brave you can increase the standing bias on the RF amplifier but this can result in instability when coupled up to the customers antenna. I think I used to do something on the FM strip on a mk1 as well around the ceramic filter. Also there's a way to alter the front end components to get better receive over all 120 channels. Also, if you align the 148 up as per the factory service info it causes the radio to go deafer at the extreme ends of the range. There'a a way to do it so the radio can be spread over the 120channels without sacrificing performance in the centre. This works on a standard radio and a modded one. If you align (peak) it up as per the factory manual you can actually make it very deaf at the extreme ends if you get it even slightly wrong. if I ever get hold of a mk1 I'll test one in my electronics lab here and show the difference all the above can make. Every now and then 148s get this sort of attention. I remember a member off here getting £300+ for a mk2 a couple of years ago. I pm'd him to congratulate him! It may have been something to do with the serial no. being the same as his bank pin number? Apart from the S meter lazyness and the mk1 requiring more work to modify its still a great radio. Personally if i wanted a radio for just standard coverage no nonsence and got offerd a clean mk1 cheaper id go for the mk1. Im shure the needle can be improved if its a major problem. I heard one suffered more bleed over problems but i cant say i noticed when i owned a mk1. Well I decided it was my mk1's turn again last night and got straight into Germany Bremen, Hanover, Frankfurt among other places, then France and finally Italy. It was great fun blasting into Europe with my £55 radio. I must recommend these little radios to anyone who's bored of magnums/cybernets or even mk2 cobras. It seems that the mk1 was phased out purely on build costs in favour of the less complicated matrix system in the mk2.....Mine certainly works as well as my mk2 on FM at least. I think the Mk1 is actually better on RX. I may be opening a can of worms here... but after having had several Mk2's / 360FM's etc. I really have come to this conclusion..
... and try one out on a Silver Eagle - awesome ! I suppose so many years down the line it depends on what kind of life the radio has had. As with all other kinds of "Vintage" radio's a high percentage will have been tweeked, modded, drilled, blown up, thrown around then tweeked again etc. So there will be good ones and bad ones (and downright terrible ones) out there. I must admit it's been over a decade since I last owned a MK1, but all this positive chat is starting to make me hanker after one. It's funny but Ludwig and myself have come to the conclusion that our mk1's sound nicer (especialy on FM) on receive than our mk2's. All I know is that I really enjoyed running mine last night.